With the uncertainty of today's tax environment, our ability to think beyond the present and be ever conscious of future tax implication is what sets us apart from our peers. We apply our in-depth industry knowledge, consider many business and personal obstacles and provide expert counsel to help clients implement decisions that help deliver real value to their business. Among the many services we provide is the preparation of corporate, partnership and individual tax returns. 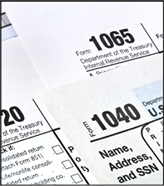 We also provide tax planning for closely-held businesses, as well as family tax planning. Expert representation before the Internal Revenue Service, in addition to state and local entities, is another part of our services. The benefit of these tax services being driven by one firm establishes a synergy that serves our clients extremely well.